WPML is the most complete and powerful translations plugin for WordPress. You can use other plugins but WPML will save you tons of time and will give you more flexibility and quality. WPTF is already integrated and tested with this plugin. WPML is not free, you must buy it for 29$, but WPML will let you translate your website faster and better than with any other plugin, and you know, time is money. Remember that if you need to translate all the theme and plugin strings you need WPML String Translations available only for Multilingual CMS of $79. Go to WordPress menu > Pages and click on blue + icons below the flags for translate the page. Really simple. To translate every string and text of the theme, including buttons, menu text, and everything, you must install also WPML String Translations available only for Multilingual CMS, buy it here and choose the second product Multilingual CMS. Go to first area Strings in the theme and click the button Scan the theme for strings and wait. Go to second area Strings in the plugins, select Hybrid Composer, and click the button Scan the selected plugins for strings and wait. If your website is not multilingual and you need only to translate english to another language Loco translate is the best solution. Below the instructions. Download and install Loco translate - https://it.wordpress.org/plugins/loco-translate/. Go to Loco translate > Plugins from the left WordPress menu. 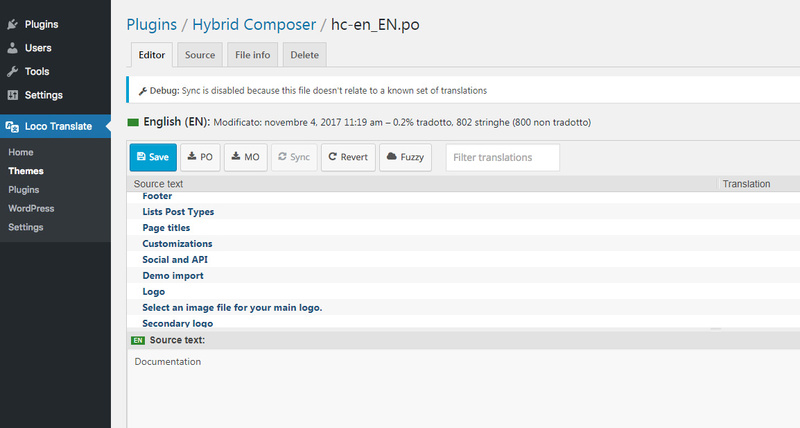 Click Hybrid Composer and select the language to translate, you will see only english. To translate the menus check the menus documentation. To translate the Lists Post Types check the Lists documentation.